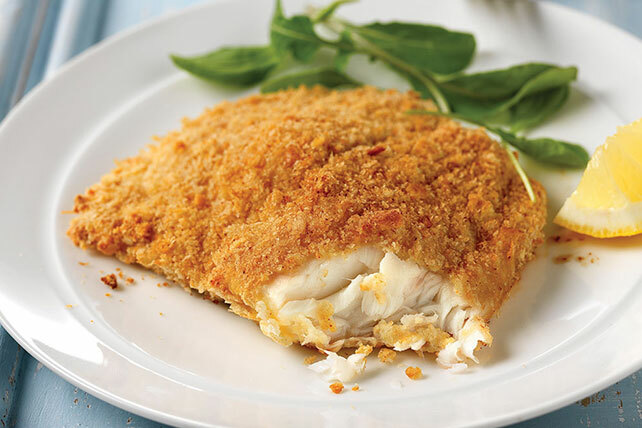 Beautifully golden on the outside, flaky and tender on the inside, this fully flavorful Crispy Fried Fish recipe is virtually foolproof to make. Mix first 5 ingredients in pie plate. Beat egg, dressing and mustard with fork in separate pie plate until well blended. Place flour on plate. Dip fish in flour, then in egg mixture, then crumb mixture, turning to evenly coat both sides of each fillet. Place on foil-covered baking sheet. Prepare using catfish or any other kind of white fish fillets. Top cooked fish with a quick sauce. While fish is baking, whisk 1/4 cup PHILADELPHIA Fat Free Cream Cheese with 1 tsp. GREY POUPON Dijon Mustard in medium bowl until blended. Gradually whisk in 1/3 cup fat-free reduced-sodium chicken broth. Stir in 1 Tbsp. fresh lemon juice. Pour into small nonstick skillet. Bring just to boil on medium heat, stirring constantly; simmer 5 min. or until thickened, stirring constantly. Serve over fish.